Twenty outstanding structures have been nominated for the Wood Awards 2017 shortlist, featuring some of Britain’s best architectural designs in wood. The judging panel was led by architect Michael Morrison of Purcell. 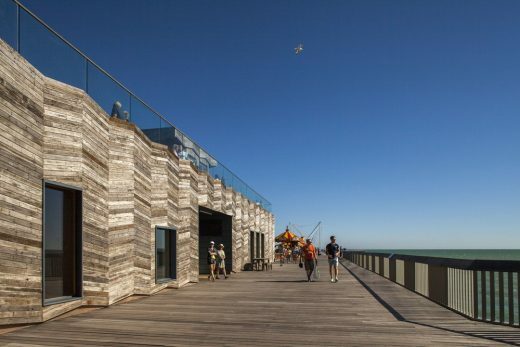 The 2010 destruction of Hasting’s Pier by fire led to an opportunity of redefining what a 21st Century pier could be. dRMM’s re-design is a well-serviced platform that can support endless uses; from big-top circuses to international markets. 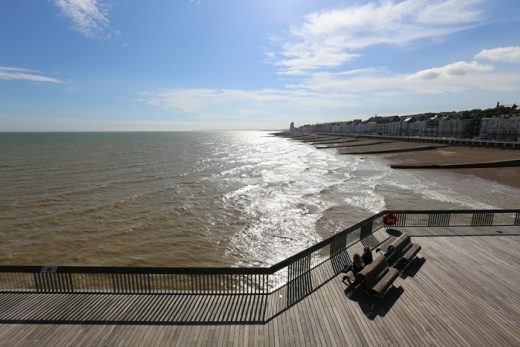 A new visitor centre replaces the weakest central section of the damaged pier. 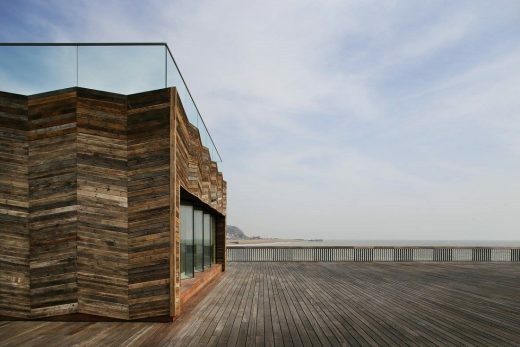 The centre is a CLT structure clad in salvaged pier decking. Reclaimed timber deck furniture was designed by dRMM and Hastings & Bexhill Wood Recycling as part of a local employment initiative. The experience of free space and ‘walking on water’ is heightened by a louvered balustrade design and quality timber deck. 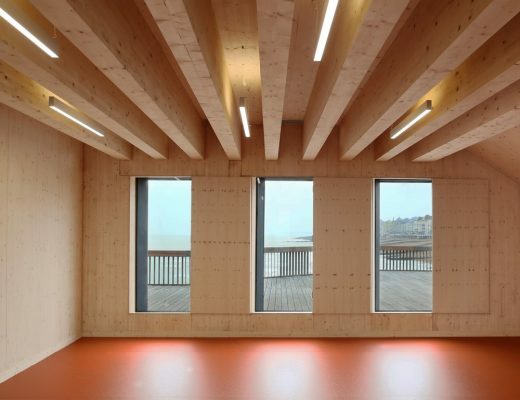 The new pier offers flexibility, material and functional sustainability, and an uninterrupted vista of the natural and built surroundings of the special seaside town of Hastings. It has taken a seven-year heroic collaboration to turn a smouldering pier in disrepair and decline into a vibrant public space with a palpable sense of ownership. This collaboration has been between the community, the Council, the engineers and the architect and it is the architect’s vision which has been vital throughout to steer the process. After extensive stakeholder consultation, it was clear to dRMM that the pier would be expected to host many different populist scenarios. Predictably enough, it transpired that it had to be everything to everybody, with an absent owner not responding to the increasingly Dangerous Structure repair requirements, and no rebuild budget available in a run-down seaside town. Lateral thinking was required to make a structurally and socially sustainable project actually happen. The architects had to write the brief and help raise the budget before redesigning the pier. Their ‘master-move’ and response to this brief was to design a strong, community led/owned serviced platform which could accommodate a whole host of uses, from music concerts, to international markets. ‘In homage to conceptualist Cedric Price, users bring their own architecture to plug in and play.’ This concept is really working in practice and should be commended. 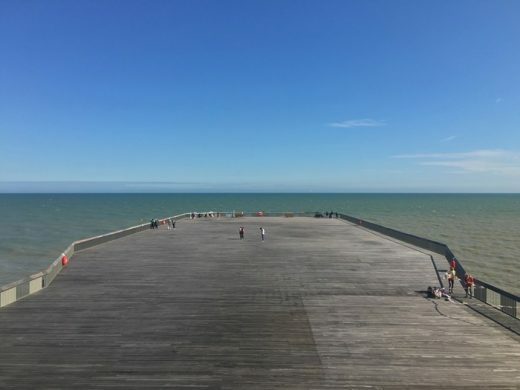 The decision not to place any building at the end of the pier, which is possibly the obvious position to site a building, is an extremely powerful move. The large open space provides a sense of calmness and delight, with a strong connection to the sea and the seafront. The experience of free space and ‘walking on water’ is heightened by the optics of a very beautiful, louvred balustrade design and quality timber deck. The new visitor centre replacing the weakest section of the damaged pier is a relatively simple CLT structure clad in reclaimed timber which was salvaged from the original fire-damaged pier. This helps to create a strong feeling of place and belonging. It boosts an elevated, rooftop belvedere where locals go for a coffee or cup of soup. It offers adaptable space for events, exhibitions and education. Reclaimed timber deck furniture was designed by dRMM and Hastings & Bexhill Wood Recycling as part of a local employment initiative. The new pier is not a lonely pier: rather, it is extremely welcoming in its design, with free, open entry to the public. It offers flexibility, material and functional sustainability, and an uninterrupted vista of the natural and built surroundings. This is a Heritage Lottery Funded project and it has become a catalyst for urban regeneration. From a conservation perspective, this project has reinvigorated a fire-damaged historic structure and facilitated a contemporary and appropriate new 21st century use. 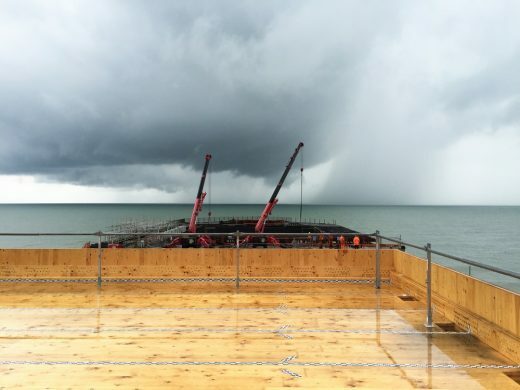 The project has been mindful to integrate material from the original pier in the new design, and the process of restoration was used to help train a new generation of craft specialists. 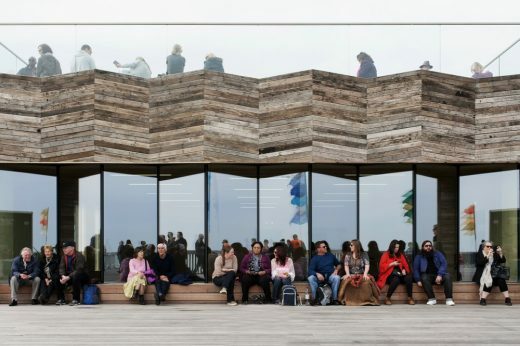 de Rijke Marsh Morgan are announced today as the winners of the competition to select an architect for the redevelopment of Hastings Pier. 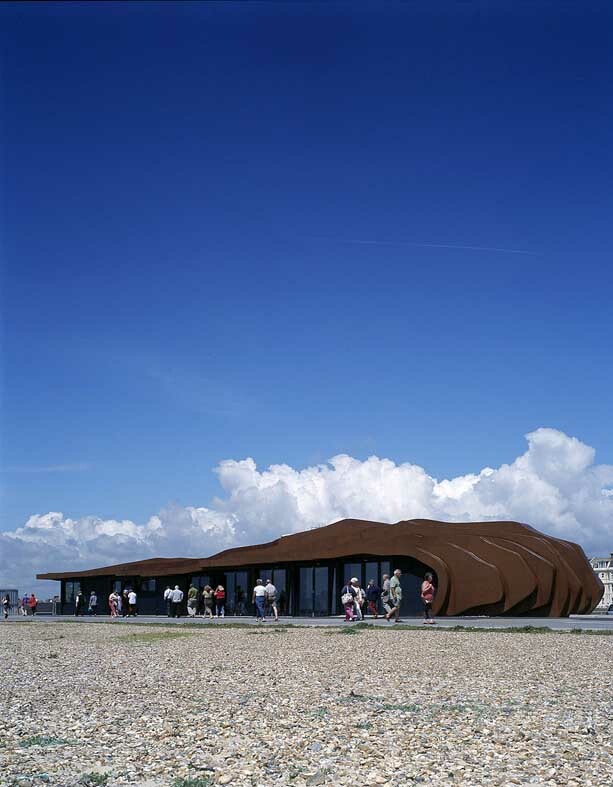 Launched in October last year by RIBA Competitions on behalf of Hastings Pier and White Rock Trust (HPWRT), the competition attracted over 50 expressions of interest from architects from the UK and beyond. HPWRT was established with the ultimate goal of reopening and revitalising the pier as a community based asset. Opened in 1872 the pier is prominently positioned, but over the years its condition has been left to deteriorate, and it was completely closed to the public in 2008. The competition announcement asked for architects with ‘exceptional design skills’ and experience in engaging the local community. de Rijke Marsh Morgan were one of a shortlist of six practices chosen from over 50 applicants. Also on the shortlist were Niall Laughlin Architects, Wilkinson Eyre Architects, FAT, Adams & Sutherland and White Arkitekter AB. 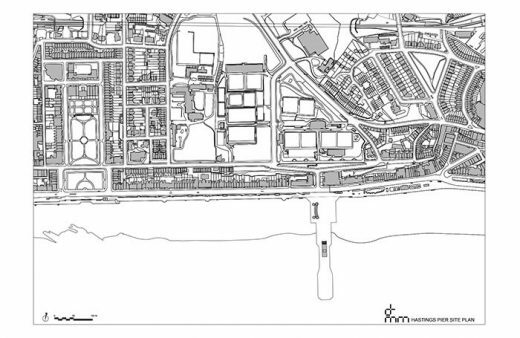 dRMM will now work closely with HPWRT to support them in their future funding and design development strategy, to develop a design and delivery plan that will help HPWRT achieve its ultimate ambition for a revitalised pier that will kick-start the wider regeneration of Hastings and St Leonards. 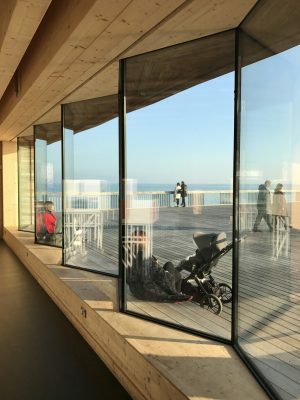 RIBA Competitions is working with Hastings Pier and White Rock Trust (HPWRT) to support them in the selection of an architect for the redevelopment of the Pier. HPWRT was established with the ultimate goal of reopening and revitalising the pier as a community based asset. The competition was originally launched on 24th September, however a fire in the early hours of the morning on 5th October resulted in the competition being put on hold. 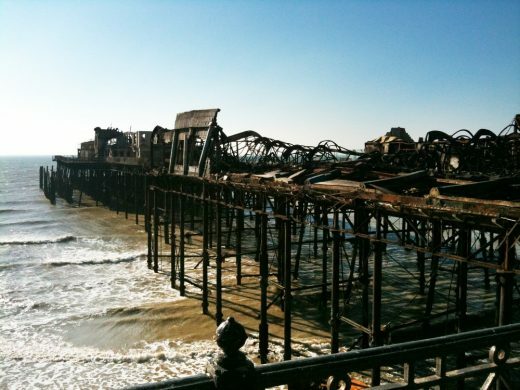 A sub-structural survey was commissioned by Hastings Borough Council on 11th October which has suggested that whilst damage to the pier is substantial, there has been minimum impact to the columns of the sub-structure. 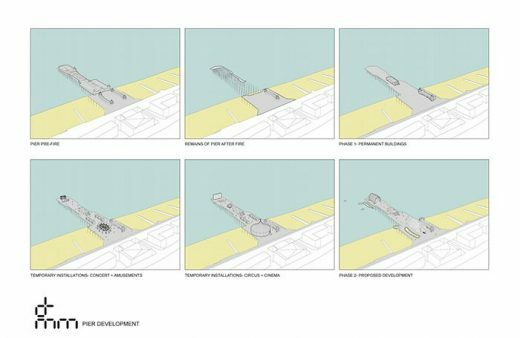 Therefore, although some emergency work is needed to stabilise the pier, the original ambition behind the project remains, and the decision is to proceed with the competition to select an architect for the pier’s redevelopment. Opened in 1872, the pier is prominently positioned in the heart of the vibrant seaside towns of Hastings and St Leonards. Even before the fire, the pier was in a poor state of repair, and over recent years its condition has been left to deteriorate. In June 2006 the pier was partially closed, completely closing to the public in 2008. The ambition is to select an architect design team to work with the HPWRT to support them in their future funding and design development strategy. Applications to Community Buildings and Heritage Lottery Funds for the renovation and redevelopment costs are underway. Selection of the successful design team will be by competitive interview, and HPWRT is hoping to attract interest from designers with exceptional design skills and experience in engaging the local community. The deadline for expressions of interest is 11th November. Opened in 1872, Hastings Pier is prominently positioned in the heart of the vibrant seaside towns of Hastings and St Leonards. Over recent years the condition of the pier has been left to deteriorate and in June 2006 the pier was partially closed, completely closing to the public in 2008. HPWRT was established with the ultimate goal of reopening and revitalising the pier as a community based asset. The view is that the pier will continue to deteriorate unless vital restoration work takes place. 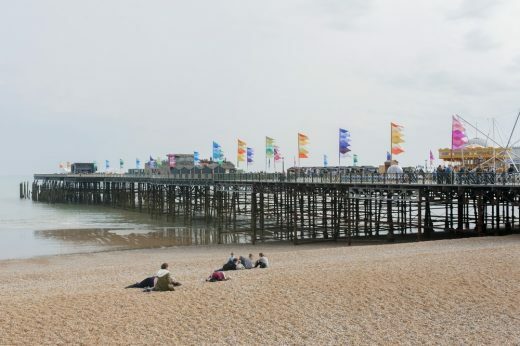 A compulsory purchase order of the pier has now been agreed by Hastings Borough Council, with a back to back transfer to HPWRT. The aim is now to select an architect design team to work with the HPWRT to support them in their future funding and design development strategy. Applications to Community Buildings and Heritage Lottery Funds for the renovation and redevelopment costs are underway. Selection of the successful design team will be by competitive interview, and HPWRT is hoping to attract interest from designers with exceptional design skills and experience in engaging the local community. Experience in working in historical setting is ideal but not essential. The deadline for expressions of interest is Thursday 14th October 2010.